This may have nothing to do with SH3D or 5.0 Beta 2, but when rendering videos beyond a minute or two computing time, on a SH3D file opened from the 64 GB MicroSD, the MicroSD is unmounted and Win semi-hangs telling me to re-insert the disk. - It's possible now to make the objets of a level not viewable with a new checkbox in the level dialog box. When a level is not viewable, the objects added to it are simply not displayed in the furniture list, the plan and the 3D view, and its tab is written with a disable color (i.e. grey in most cases). It's also impossible to add new objects to a not viewable level. - Until now, levels were sorted in the order of their elevation, then in the reverse order of their height. 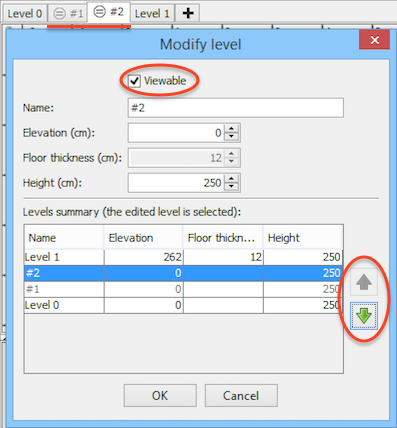 This second criterion doesn't exist anymore (projects strongly based on this order should need only small changes), and now levels at the same elevation are ordered according to your wish using the new up and down arrows added at the right of levels list. This list is now displayed from top to bottom and is updated while you change values of the edited level. - To distinguish a level at the same elevation as a previous one, its tab displays in front of its name a new icon showing an equal sign surrounded with a circle. - To help you create faster a new level at the same elevation as the selected one, the Plan > Add level at same elevation menu item was added and I assigned to this menu the shortcut Ctrl+Shift+N (cmd+shift+N under Mac OS X) which is generally used for layers in other software, and changed the shortcut of Plan > Add level to Ctrl+Alt+N (cmd+alt+N under Mac OS X). I hope you'll like the way I programmed this new feature. I ran many tests, but please, test this also on your side and don't hesitate to report your opinion about it. By the way, I think I fixed the bug for some baseboards that weren't cut. Actually, this happened for walls at upper levels. Thanks for insisting. Sorry, it won't be this time, and just because of the shape of ceiling plasters, I don't think it will happen anytime soon. I've test it and it's very useful for me. I put dimensions on this layer and it show when I need. Also is useful for different variants of furniture arrangement at the same level. The option popup when 2click on layer tab name or right-click somewhere in the current layer. It's useful for additional information in 2DSymbols library. Very nice. Congratulations. So far nothing wrong, but then I need to figure out different things to do with this feature. For now it seems a very cool way of toggling alternative layouts, but the process is (ever so slightly) disturbed by the three step process for hiding and showing the alternatives. Would it be easier to use if a tab checkbox, right-clicking (or something) the tab toggles visibility? Maybe a context menu on the tabs with "Add level", "Modify level" "Delete level" "Show/hide level". This would de-clutter the 2D plan menu and be easy to use (but I guess following your stringent menu thought and concern about some users not being used to context menus could be an argument against.) Just a thought. And don't get me wrong. I really like the feature the way you implemented it.